Last summer, Wen Lee and her husband Chris Stratton, had a surplus of vegetables growing in their garden. Looking to connect with their neighbors, the pair put their bounty of zucchinis, tomatoes, peppers, and other vegetables on their front porch in a cul-de-sac in Temple City, California. But after realizing that some might be wary of walking up to their house, Lee and Stratton came up with the idea to build a community shed that would be friendly and accessible. It is a statement that we are not simply individual households — we are a strong neighborhood that is open, friendly, and safe. This is the kind of neighborhood I want to live in. "The neighbors that I met through this process were great, and I loved giving away the produce, but we were like, 'well, this chair is kinda janky. It's sitting on our front porch and you have to walk up all the way and see if there's anything,'" Lee said. The couple built what they call a "Share Shed" using donated paint from neighbors, scrap wood, and other material leftover from previous projects. The shed allows community members to take what they need for free, Lee said, as well as share produce and other goods to "build community." Lee — who detailed the shed's creation on Frugal Happy, a blog dedicated to living a low-impact lifestyle — believes community-focused projects like the Share Shed and the "Little Free Library" can be beneficial to neighborhoods. "Curious neighbors have come by to take a look and many have told us how much they like it," she wrote on her blog. "Whenever we put veggies on the shelf they disappear within a couple days, which feels gratifying. It's working." To make sure community members felt invested in the project, Lee and her husband involved them in its construction. Some neighbors donated materials while others helped with the decor. "I think the construction of the shed process helped to shape how the rest of the neighborhood viewed it," Lee said. "Because we were building it, people could see us building it, and we were looking for paint and help, so I would ask neighbors if they had extra paint." A neighbor volunteered to write Chinese characters on the sign to encourage Chinese-speaking residents to participate if interested. According to Census data, approximately 47 percent of Temple City's estimated 36,084 residents are of Chinese descent. The shed also has instructions printed on the side in both English and Chinese. They read, "Everything here is free! Take what you love; Donate what you don't need." Projects such as the Share Shed can serve as a vital social bonding experiment, according to Dr. Long Wang, an assistant professor of nutrition and dietetics at California State University, Long Beach. Exposing young children to community gardens and fresh produce makes them more likely to incorporate these foods into their diets as they get older, he noted. "If kids have early exposure to growing produce, they are more likely to have a healthier relationship with the produce," Wang said. I think the construction of the shed process helped to shape how the rest of the neighborhood viewed it. While Asian diets traditionally have more plant-based foods, diets have changed in the past few decades to include more animal-based products, according to Wang. That can be a cause for concern due to a possible higher risk of diabetes and cardiovascular issues. Having a project like the Share Shed can also be helpful for low-income communities that might not be able to afford fresh produce or are isolated from places where they can access it, Wang added. Wang noted that Americans do not have enough fruits and vegetables in their diets, as intake is below the recommended amount. According to the Centers for Disease Control and Prevention, only one in 10 adults meet federal fruit or vegetables recommendations. 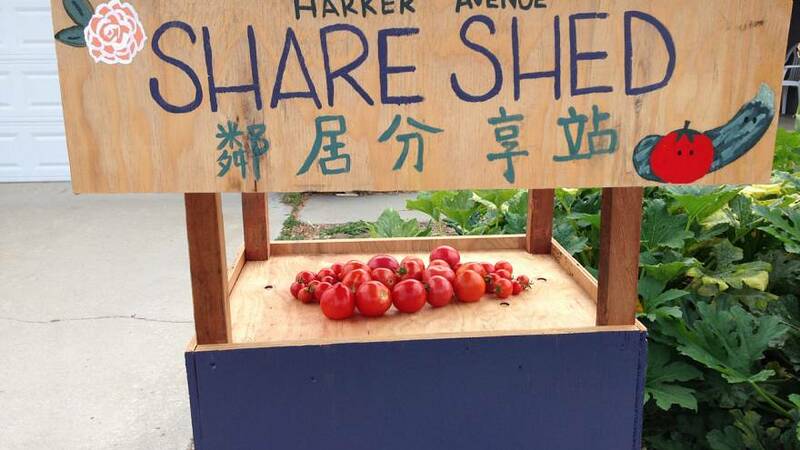 "Projects like the Share Shed can provide residents with fresh, locally grown produce for free," Wang said. "This not only will help the residents improve their diet, but also provide an opportunity to build a stronger community with participation by residents." It's that community building aspect that holds much appeal for Lee. Prior to moving back to her childhood home in Temple City after the passing of her mother, Lee was part of a close-knit community in Oakland, California, and for many years biked and took public transit. Moving back to Temple City left her with a bit of nostalgia and shock, as Lee realized the neighbors on her block often kept to themselves. The lack of interaction brought back memories of when she was a child growing up in a "protective and cautious" household where she was told to stay inside. "I do remember growing up, we never talked to our neighbors, and I do remember when the doorbell would ring, our mom would tell us to hide and pretend we weren't home," Lee said, adding that she hopes to create more of an open dialogue for neighbors to engage in their communities. Whenever we put veggies on the shelf they disappear within a couple days, which feels gratifying. It's working. Since its debut, the Share Shed has continued to receive positive feedback, Lee said. Some treat it as a "drive through" produce stand and young children often peek into the shed to see if there are any new offerings for the day. "I could tell that it was something a little new to them. I think we sparked a lot of curiosity among neighbors," she said. According to Lee, people have donated everything from persimmons to a bag of guava, a batch of Hello Kitty cookies, and even an unused backpack. She hopes to see more communities build something like a Share Shed, because she believes they can create healthier, happier, and safer neighborhoods. "The Share Shed is a way for neighbors to help each other, share resources, and have fun. But most of all, the Share Shed is a statement," Lee said. "It is a statement that we are not simply individual households — we are a strong neighborhood that is open, friendly, and safe. This is the kind of neighborhood I want to live in."